Side Hinged Garage Doors are still one of the most popular searched for types of garage door on our website, and the demand for this type of garage door in the UK has increased dramatically over the past few years. As less and less garages are actually being used for housing cars than ever before and used far more for an extra add on room in the house to store anything, and more often than not these are high value items. Many garages are being used as a workshop, gymnasium, office, studio, and where the garage door fitted and required is mainly for access as a pedestrian most of the time. Look at the various side hinged garage doors available nowadays – they offer effortless operation, easy access, and specified correctly will also offer superb weather sealing and security, and all this with minimal maintenance ever being required as there are no complex mechanisms involved and also no internal tracking and mechanisms spoiling all the internal space in your garage. Insulated side hinged doors are also now becoming quite normal. The lever handles used are smooth and effortless to operate for anyone with any kind of physical issues. Traditionally most people will always think of swing type garage doors being made in timber, and there are many choices of designs and timber types certainly available. We can offer Cedar, Idigbo Accoya and Oak as mainstream timber species choices. Cedarwood is the main timber type generally used, being light in weight and in colour it can be stained or painted to almost any colour and is also very stable in our very variable British climate. Accoya is probably the best all round timber with unbelievable guarantees on longevity. Any unsorted redwood is a risky softwood timber for side hinged doors, with very high rates of failure through twisting and cracking after short periods, it is not stable with the variations in air moisture in the UK. We do not offer low priced and quality timber doors, and nor do we recommend them. The price differences seen online may seem enormous until you begin to add in all the hidden extras required such as the sub frame, door hinges, hardware, locking and of course the final finishing of the doors, most of which are standard with many of the hinged doors we supply – Check the differences carefully!! If your requirement is based on price alone then look to the single skin, steel side hinged garage doors available as they are very stable and practical with some classic designs and colours available. 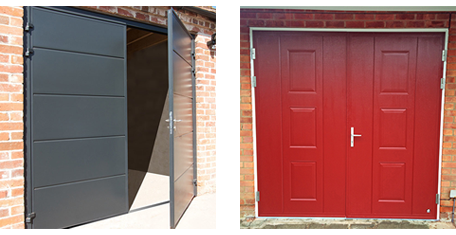 Steel may not be a material normally associated with side hinged doors but is now available in the UK with the fantastic other option of a range of double skinned, insulated steel doors with a foam filled core providing a 40mm thick insulated garage door panel with incredible strength and security. These insulated doors offer components at much higher levels than most other doors as they have to deal with quite heavy panels so the hinges are super sturdy, and the locking mechanisms used are usually far superior as the panels can take the mechanics internally of far more robust locking. These are fact becoming the preferred hinged type door from manufacturers such as Carteck and Ryterna. GRP or fibreglass is also a great material for swing doors, it is a strong and stable material and is offered with some great designs always produced using a mould from an original timber door design. A good range of GRP doors are available and they are very low maintenance whilst looking just like the real timber equivalent in the colours and graining. Again, like the steel side hinged doors steel fixing sub frames are normal with GRP doors and therefore offer greater stability and strength in the overall product. The Garage Door Centre also offers a very comprehensive range of insulated personnel side doors in the same construction to complete the security and insulation of your garage. These can be from a standard or purpose made range of sizes. The emphasis is on a complete package with the furniture and sub fixing frame all factory assembled and ready to go once the door gets to site. We have personnel doors with an emphasis on security, and all doors are either in standard or purpose made sizes to suit your opening perfectly. The phrase ‘doorsets’ defines our ranges with everything you need completely supplied and factory assembled for the easiest on site fitting. Generally side hinged doors in steel, timber or GRP are manufactured up to around 8 feet (2438mm) wide and around 7’6” (2286mm) high, they can be made much larger but with limitations on the design and timber used as the weight and strength becomes more important as well as the hinges and fixing sub frame used to support the doors when fitted. Nearly all hinged garage doors are made to order nowadays, although there are some standard sizes available for better pricing where standard sizes can be accommodated. The double skinned steel side hinged doors can be made up to a larger width of around 3 metres wide, please call for latest details. What Fixing Sub Frame is Required? All side hinged garage doors require a fixing sub frame of some sort and these are normally either steel, aluminium or timber. In most cases a timber sub frame is a nominal 70mm x 70mm but a 90mm depth is generally preferred to enable a stop to be added and also give more strength. In steel construction the frame is usually between 50 and 70mm wide and varies in depth. The sub frame is required for so many reasons including fixing the hinges, weather seals, a proper stop for the door panels to hold against when closed, squaring up the structural opening and generally making the doors work in the best possible way with the best sealing possible. Have you ever seen an internal hinged door inside your house without a sub frame fitted? The sub frames are either box section steel, aluminium or various timber profile sections, with or without a rebate. When using cedar wood door panels we always recommend the use of a cedar clad timber frame where the main timber is not cedarwood as it is not recommended for structural framing. You would usually want the main door panels and the frame to match each other once treated, especially if the requirement was for a lighter stained finish and this is only achieved by using this cedar clad frame. The steel box section frames have great stability and strength to enable the use of uprated locking systems in the doors they a supplied with. The steel and aluminium frames are generally powdercoated in a colour finish to match or contrast the main door panels. Certain steel frames can also be clad of course in a matching timber to compliment the main door panel. The only time you can potentially forget the sub frame is when the garage opening is of a timber frame construction or the rare case where you may have a steel box section garage opening construction but even then without the sub frame you will not have the benefits of rebated edges, seals and the hinges may not perform as they should on the frame they were designed with originally. How Secure are Side Hinged Doors? Security on a pair of side hinged swing type doors can be absolutely first class, but only if the main door panels are strong enough in their general construction, as well as the surrounding sub frame used. The best hinged doors for proper security are the double skinned insulated steel doors we supply from Carteck, Ryterna and Hormann, with an optional 3 point locking upgrade. The construction of these doors allows far more robust locking mechanisms to be built in and combined with double rebated edges and a super strong sub frame the overall result is a very secure set of doors indeed. Timber and GRP doors can also be secure if uprated locking is specified and they are installed with a steel or hardwood timber sub frame. If you want a super secure set of doors we can provide double skinned steel doors with rebated edges, 9 point locking and a specification of resistance that would be happily used on a shot gun cabinet. Designs are often compromised when high levels of security are required as the construction methods do not allow fancy pressings and designs as the steel used will usually be of a thicker guage than normal doors. All this security also applies to single width pedestrian hinged doors of course as they use exactly the same principals as the double hinged doors in all ways. Cheap softwood, or low quality single skin steel side hinged doors can never be very secure as the panels themselves can be forced and bent relatively easily, making any type of locking fairly useless to the determined intruder, however good it may sound. Think carefully about the security, as add on locks can be clumsy and difficult to install as an after sale item. There is really only one thing worth concluding about side hinged garage doors and that is that you will only get what you pay for, and this is really obvious if you take the time to investigate these types of doors properly. A cheap pair of doors in low grade softwood timber will only last you a very short time before needing replacement. A proper set of quality timber, steel or GRP hinged doors could last for many years indeed, a proper investment for your home, increasing security, insulation and general ‘kerb appeal’.